Editor’s introduction: Week 5! After a full month of rarities from Keith Adam’s Oddica, he’s back to show us some of the sickest cards ever. Have you ever seen a Black Lotus that costs 3 mana? Do you want to know more about this Invitational Cards? Keep reading after the jump! 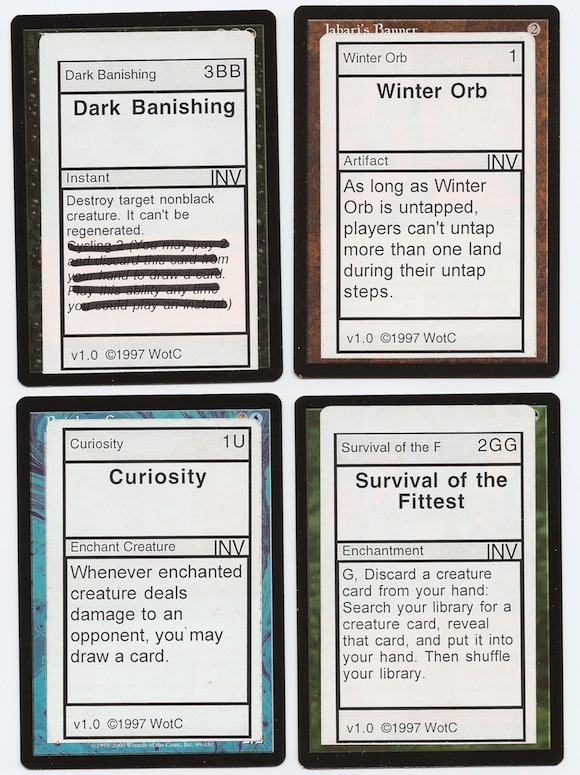 TheMisprintGuy Magic Oddica – Chapter V: Invitational Cards. A Mana Drain that costs 3UU, or a Dark Banishing that costs 3BB? Perhaps these cards would not be as beloved as we think of them today. However, a Winter Orb that costs 1, or a Winnow that costs W would undoubtedly see much more play in Vintage format with such a reduced casting cost. Remembering that all players are using the same cards that you are, each player had to decide what cards and strategy they are going to use. Simple in nature, all cards are simply a sticker placed over another color-appropriate card. These are not misprints, nor are they test prints. But locating any of these cards is very difficult, as only 16 of each deck were produced. A few of the decks were even thrown away as the participating contestants walked out the door. I’m sure that none of them thought that a few years later there would be collectors intent on spending lots of money to pick up a sticker that has a Black Lotus with a casting cost of 3 on it. I mean really… you can’t even play with it, right? Who would want that? Also, with a casting cost of three mana, want to take a guess as to how many of the 16 players chose to play with it in the first place? 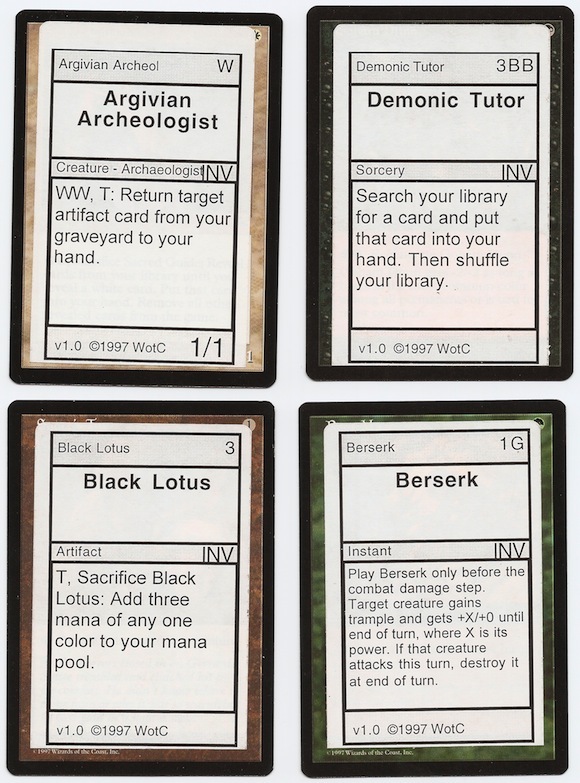 Here you will see that only six of the sixteen contestants chose to use Black Lotus in their deck, a far cry from being the most chosen… and what was the most well received? Both Tracker and Hunting Moa were reduced to 2G, and chosen by fourteen of the sixteen involved.